In the mood for something with a kick a few weeks ago, we hit Chilli Fagara for a nice bit o' spice. We got the spice, no kidding, but tongues and lips aflame, wallets emptied and feeling thoroughly disgruntled (not to mention still a little hungry), we departed in confusion. We had heard good things, and there was nary a good thing to be found. 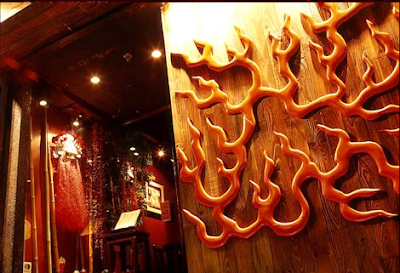 The restaurant, situated on Graham Street opposite Sift, is typical Soho -- tiny, dark and cozy. So cozy, in fact, that whichever unlucky individual is alloted the table in the front by the door has to rise and tuck in his chair every time anyone enters or exits the restaurant. The service, too, on the night in question, left a little to be desired. Besides botching orders, taking away our plates before we were finished and generally, literally sticking their arms into everything, the waitstaff didn't seem to want to be there. Fair enough -- after 30 minutes, neither did we. We made the mistake of soliciting the server's opinion while ordering, and he recommended the crab, pictured above. 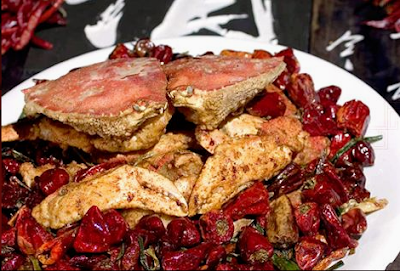 Holy spicy crab, Batman, it was HOT on the outside, due in part to the mounds and mounds of chilis used to fill the plate, resulting on a fiery hot, crispy exterior and a somewhat lacklustre interior. The other dish we ordered -- Pearl of the Orient chicken balls (or something like that, I may have made the name up, I'm trying to repress the experience) -- was similarly themed. A chickeny exterior was wrapped around a lychee for a cute, hot-n-sweet dish, but nothing outsanding. Same bed of chillis below. The highlight of the meal was garlic fried veggies and a passable fried rice. Given the stellar reviews from the English mags in Hong Kong, we were forced to conclude that the place uses chillis to hypnotize its customers into confusion. The nail in the coffin was the price. After ordering a host of dishes under HK$200, we discovered that the recommended crab had added a HK$600 price tag to the bill. 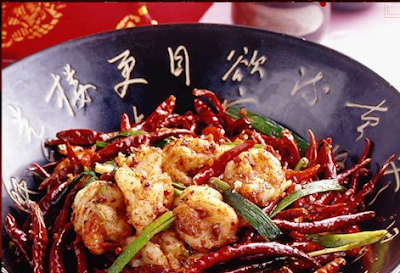 If you want a good Sichuan experience, try Da Ping Huo instead (Hilltop Plaza, 49 Hollywood Rd, Central. Tel: 852 2559 1317). Or Yellow Door ( 6/F, 37 Cochrane St, Central. Tel: 852 2858 6555), which I haven't tried but is also rumoured to be fantastic. Both are private kitchens so book ahead. I'm not even going to provide booking info for Chilli Fagara here -- just because you add chillis, doesn't make it Sichuan food. Or even food, really.